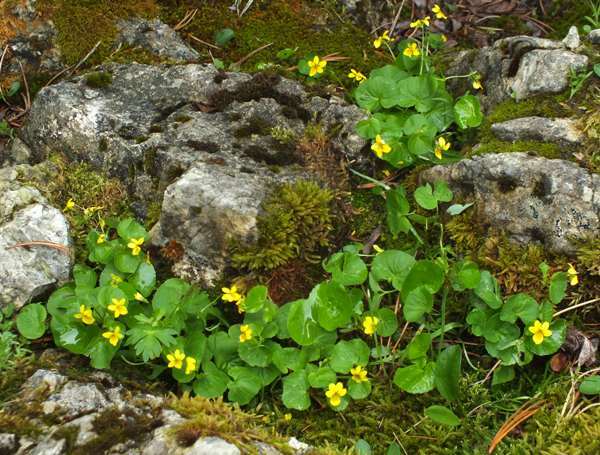 This gregarious member of the pansy family has many common names including Yellow Wood-violet, Arctic Wood -violet, Twinflower Violet and Alpine Yellow-violet. Plants are perennial and grow to about 20cm in height often in neat pincushion shapes. 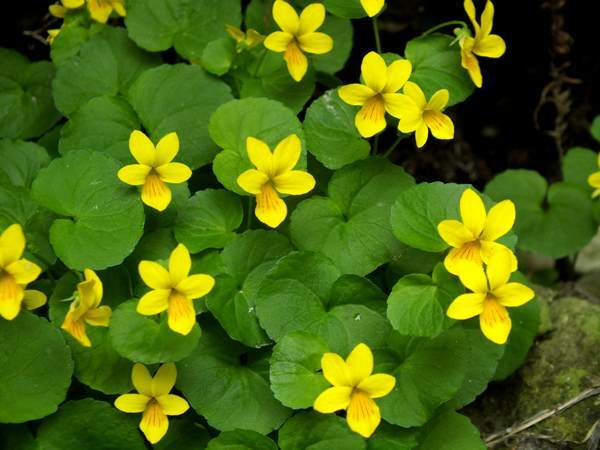 The fragrant, red-veined yellow flowers are typically 1cm across and have five petals the lowest of which has a short spur; there are five small sepals and each flower has five stamens fused in a single style. Its basal leaves are roundish and there are kidney-shaped stalked leaves opposite on the stem. As with other members of its genus, Viola biflora produces three-valved seed capsules. 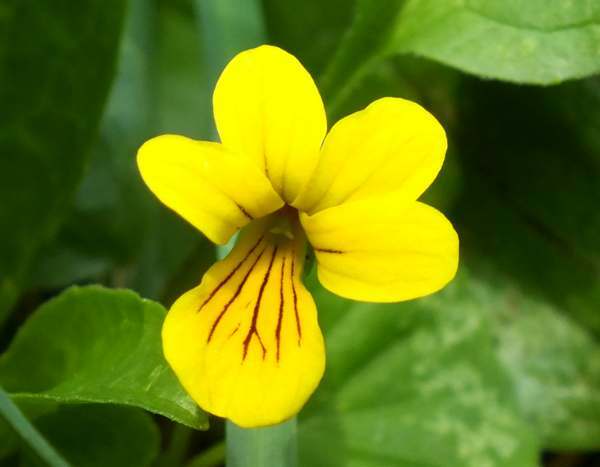 The flowers and kidney-shaped leaves of Viola biflora seem to shine even in dark crevices. 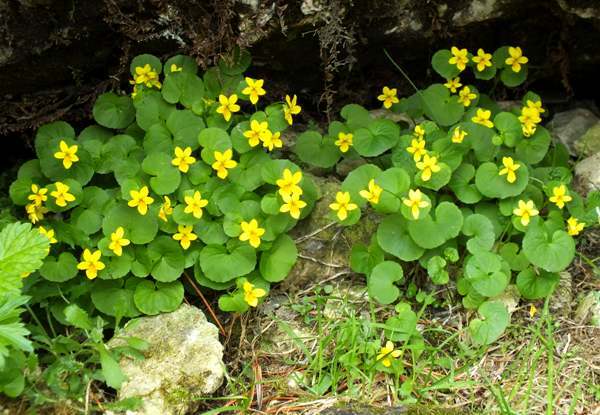 Viola biflora is not native to Britain and Ireland (although it has long been a popular garden flower), but it occurs in alpine locations throughout most of mainland Europe and in many parts of Asia including India and China; it is also recorded in North America. This is an alpine wildflower and occurs at altitudes of up to 3500m above sea level. Sheltered and shaded damp places are the preferred habitat of the Two-flowered Violet. We have seen then growing profusely beside wooded mountain streams and crouched beneath rock outcrops on north-facing slopes, always where they are not exposed to bright sunlight or strong winds. In Scandinavia this violet is also common in broad-leaved woodlands and crouched beneath other vegetation in tundra. The flowers appear in May and June at lower altitudes but may be seen well in to July in colder high-altitude locations. Most members of the family violaceae have flowers with some purplish areas or at least flowers some of which have purple or violet in their colouring. The genus name Viola reflects this feature; however, Viola biflora is an exception in that it has consistently yellow flowers. The specific epithet biflora means 'with two flowers'. You might therefore expect that the flowers are borne in pairs, but they are not. Rather, the name refers to the fact that this species produces two kinds of flowers: as well as the lovely and conspicuous yellow flowers it also produces, low down under the leaves, pairs of very basic flowers that do not open but self fertilise within their buds - a process known as cleistogamy. The photographs shown on this page were taken in the Dolomite Mountains, northern Italy, in May.